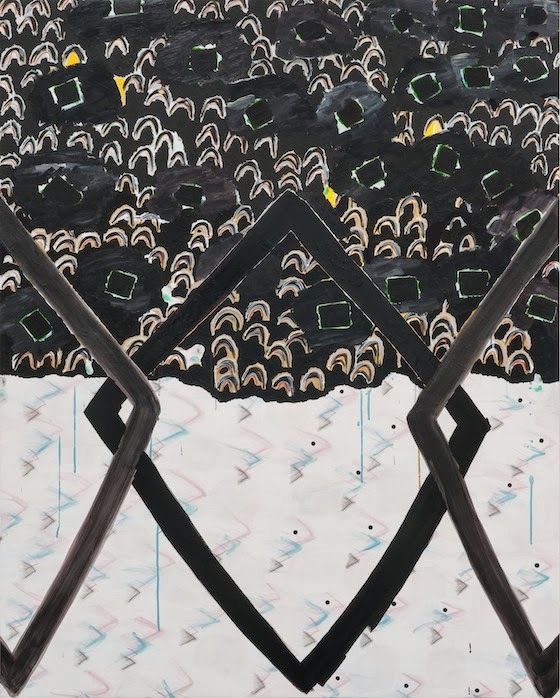 Allison Miller’s paintings strike me as calculatedly–therefore artfully–imbecilic. 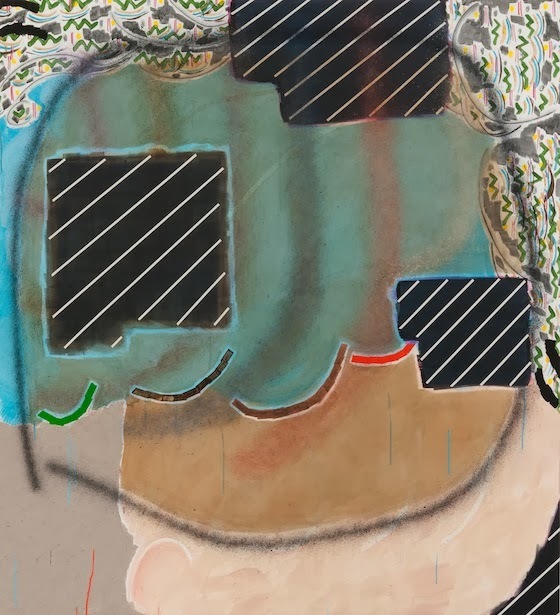 In her second solo show at Susan Inglett, the Los Angeles artist forces viewers to ask ridiculously simple questions, such as “What is this?” and “What kind of space am I looking at?” Shapes and lines lock in bad relationships, color squeezes into (and out of) unexpected situations, and ambiguous titles broadcast multiple meanings. In other words, these clumsy, uncomfortable, unresolved paintings are mysteriously unforgettable. They got under my skin. 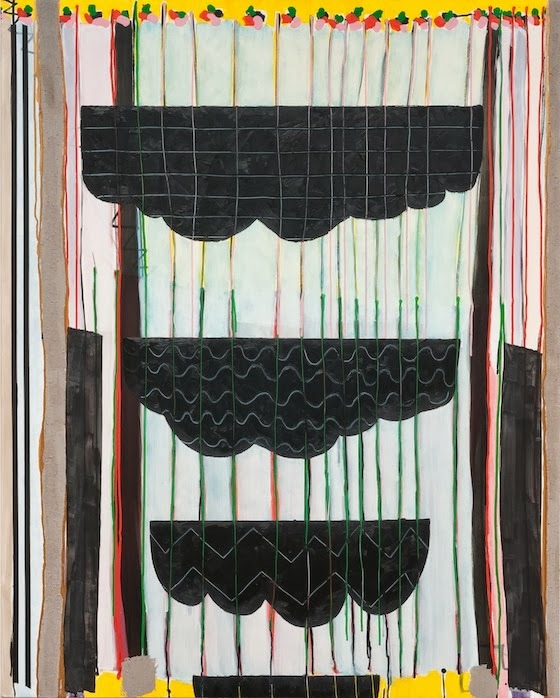 Allison Miller, Tropic, 2013, oil, acrylic and pencil/canvas, 60 x 48 inches. Last year in an interview with Tracey Harnish in the Huffington Post Miller tried to articulate her fundamental beliefs about painting and how she approaches the canvas. seen, proven, by the paintings I make. and inadvertently succeed in achieving another, unanticipated goal. 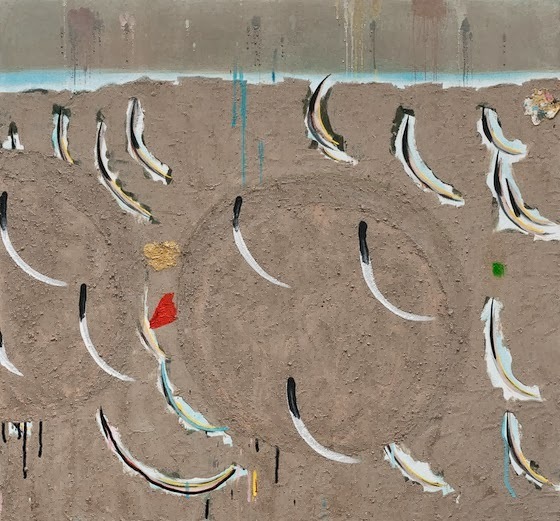 Allison Miller, Mine, 2013, oil, acrylic and dirt/canvas, 28 x 30 inches. I was struck by the absurdity that the addition of dirt mixed into the paint lent to late Braque paintings. My use of dirt is more selective but still absurd, in my mind, usually pushing the tangibility and weight of a certain area or form within a painting, or mimicking concrete or rock. This is a ham-fisted and direct way of achieving a kind of realness within a painting which sits in contrast to a line or form made of, say pencil, which is so self-consciously affect-less that it can ground a painting in its materiality — sometimes counter-acting what the dirt has done. Allison Miller, Wave, 2013, oil and acrylic/canvas, 36 x 36 inches. Allison Miller, Lean, 2013, oil, acrylic, and dirt/canvas, 60 x 48 inches. Individually, Miller’s paintings indulge the popular notion that “ham-fisted” composition is compelling content and exploit self-conscious incoherence; collectively, they reveal a steadfast commitment to shifting narrative and serendipitous discovery. As Miller moves forward, I wonder if this will continue to be enough. 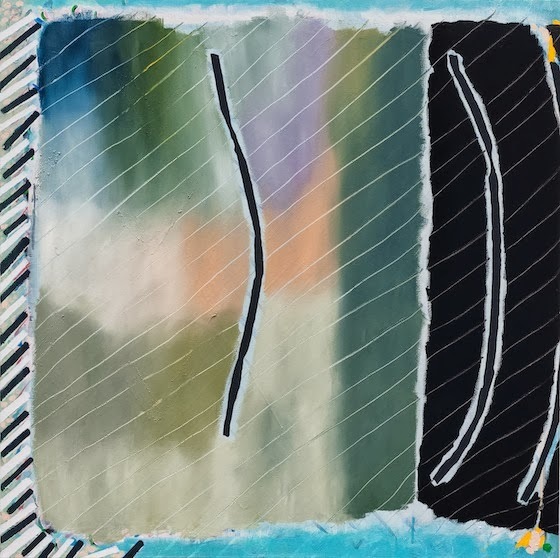 “Allison Miller,” Susan Inglett Gallery, Chelsea, New York, NY. Through October 19, 2013.